This story is about VALUES and RESOLVE. This is the first in a series of blogs presenting information about a significant player in the politics of the 2020 elections. The idea is that knowledge will help us make good decisions regarding our actions as the next elections become closer and closer. 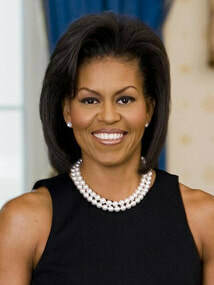 Michelle Obama really needs no introduction. Her character and personality were on stage for 8 years as First Lady of the United States. She continues to speak her values. She has written memoirs that to me are a clear and powerful statement of what integrity and honesty look like. So this blog is a plea for everyone out there to read her book “On Becoming”. For a person like me (a privileged white person) , it is difficult to imagine what growing up as a black girl in South Chicago could be like. Michelle paints a picture in vivid detail. How she came to have her values, what she experienced is written with excellent prose. The feeling produced for me was that she was leaving out nothing of significance. I wanted to applaud her parents. Educational achievements started early and never stopped until a law degree from Harvard Law. Wow! Did a bit of law with a prominent firm, met a man (named Barack), then went into public service in Chicago. Michelle shows us some tidbits of Barack not found elsewhere. We see them as a pair that work through their differences because of the shared integrity and honesty. Their devotion to their children is an important part of their story. Making decisions and sacrificing once decisions are made is significant for this part of the story. A loud and clear message from Michelle is NEVER GIVE UP. Ignore any nay-sayers, believe that your efforts matter and continue the work. We just finished a two year fight and another is beginning that is at least as important as the last. I consider this book an important political achievement. It is a picture of what we can strive for in our leadership. We may not find candidates that can match the clear integrity of Michelle and Barack. However, the picture here will give us a perspective for choosing. Policy and Party dynamics are not subjects here. This story is about VALUES and RESOLVE. The ‘Who is …’ blogs to follow will strive to discover policy and party dynamics as they mix with values. Our voice in the coming contests will have a clearer message when we know who we are supporting (or not) in more intimate detail.